Shot at the historic Belasco Theater in downtown Los Angeles, This Is Live showcases both classic songs such as "Local Girls" and "Protection" and new favorites including "Stop Cryin' About The Rain" and "Long Emotional Ride." Directed by Judd Apatow, This Is Live contains songs not included in This Is 40. 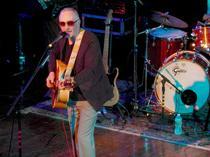 After forming in London in 1975, Graham Parker and The Rumour released their first album in 1976, quickly building a reputation for fiery stage performances as well as witty and often sardonic lyrics. Parker's angry energy preceded the punk movement, and he came to fame just prior to Elvis Costello and Joe Jackson, artists to whom he is compared. Hailed as one of the most important bands of their generation, more than one of Graham Parker and The Rumour's releases have landed on Rolling Stone's Greatest Albums lists, and they have found fans in no less than Bruce Springsteen, Bob Dylan, and of course, Judd Apatow. 1980's The Up Escalator would prove to be Parker's last album with the Rumour, although members of the band would join some of Parker's later recordings. 2012's Three Chords Good found them together again, with This Is 40 propelling them back into the limelight. In fact, he actually went so far as to film an entire reunion concert, and though fans got snippets of it before, here we get the full show in its entirety. And though it's certainly a solid concert, in an ironic twist, it turns out that the disc suffers from the exact opposite problem that most Apatow productions have to deal with: it's too short and barebones. Crazy, right? Originally filmed as part of the production for 'This Is 40,' the concert was shot in the Belasco Theater in Los Angeles and features Graham Parker and all five original members of The Rumour -- Bob Andrews, Brinsley Schwarz, Martin Belmont, Andrew Bodnar, and Stephen Goulding -- together again for the first time in 31 years. The band goes through a mixture of classic hits and new tracks from their latest album, "Three Chords Good," including "Fools Gold," "Protection," "Long Emotional Ride," and "Stupefaction." After a quick intro from actor Paul Rudd, the musicians take to the stage and segue straight into their set list. The rest of the concert mostly follows suit, and though Parker will occasionally address the audience with a few brief quips or introductions, this is essentially a straightforward performance with little fanfare or excess flash. With that said, Apatow directed the concert himself, and the show does benefit from a pleasing, cinematic look. We get the usual assortment of standard angles, including some moving shots, band close-ups, and various crowd POVs, fully covering the action in a visually interesting manner while still placing the emphasis squarely on the music. Speaking of the music, the band's style is a bit generic, but I warmed up to their approach as the runtime went on, and their style mixes classic rock with some faint punk and new wave sensibilities. Early songs sounded rather similar to each other and failed to stick out. Thankfully, the group hits a solid groove about a third of the way in, leading to a much more involving and memorable string of songs, offering a nice mixture of energetic and slower tempos –- and once Parker pulls out his kazoo, all bets are off! Likewise, as the concert continues, the musician's wit and sense of humor starts to shine through more in his playful lyrics, and though the frontman doesn't exactly have a terribly eventful stage presence, with his sunglasses and cool demeanor, Parker looks perfectly at ease and content in front of a crowd –- as if there's absolutely nowhere else he'd rather be. The rest of the group look like they're having a lot of fun too, and one gets a genuine sense that they really are happy to be back together doing what they love. Sadly, as well produced and performed as the concert is, the show is definitely on the short side (about 50 min), and coupled with the disc's barebones presentation, one can't ever quite shake the feeling that this really should have just been included as an extra on the 'This Is 40' Blu-ray disc. Regardless, what we end up with here is a solid reunion show that should certainly please big fans of the band, but doesn't quite stand alone and likely won't have much appeal outside of diehard admirers. 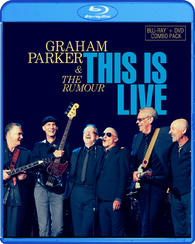 Shout Factory presents 'Graham Parker & The Rumor: This is Live' in a Blu-ray/DVD combo pack. A single BD-25 disc and separate DVD disc are housed together in a keepcase. After some warnings and logos the disc transitions directly to a standard menu. The film is presented in a 1080p AVC/MPEG-4 transfer in the 2.35:1 aspect ratio. Shot to be part of Judd Apatow's 'This Is 40,' the concert benefits from a very professional and cinematic appearance, and looks simply stellar on Blu-ray. The digital source is essentially pristine with only a tiny hint of noise. Clarity is exceptional, offering a razor sharp picture with life-like dimension. The stage's yellow and white lights bathe the screen in a golden hue and later, cooler lighting schemes offer some nice variety. Contrast is high with bright whites and deep, inky blacks, and the whole image has an impressive HD sheen. Technically strong and richly detailed, this a beautiful transfer. The show itself doesn't offer much to get excited about visually, but the video features a pleasing, glossy quality that suits the content well. The concert is provided with an English DTS-HD MA 5.1 track and an English PCM 2.0 soundtrack. Crisp and immersive, this is a strong mix that effectively brings the show right into your living room. Vocals are clean and full-bodied with nice priority in the center speaker. Distinct instruments are spread across the front soundstage with welcome separation, and rear activity chimes in with a few isolated cues and crowd reactions, offering a fairly enveloping concert experience. The music itself comes through with pleasing fidelity and dynamic range remains wide and distortion free, offering crisp highs and solid lows. The 2.0 track lacks the added immersion of the 5.1 presentation, but also provides a great listening experience -- though vocals seemed a bit deeper and overall range seemed slightly flatter. This isn't the most impressive concert track I've come across, but the music is faithfully reproduced with a nice sense of space, offering fans the next best thing to actually being in the venue with the band. Sadly, there are no special features. This is especially troubling considering that the 'This Is 40' disc actually includes a featurette about the band and the concert, which only further reinforces why this show should have just been included on that release to begin with. 'Graham Parker & The Rumour: This is Live' is a solid reunion concert that happens to be directed by Judd Apatow. Ironically, though, unlike the filmmaker's recent comedy efforts, the show actually feels a bit short. The video is fantastic and the audio mix is great, bringing the concert experience right into audiences' living rooms. Unfortunately, there are absolutely no special features, which is especially disappointing considering the 'This Is 40' disc actually has a featurette dedicated to the band. At the end of the day, this really should have just been included as an extra on that release, but big fans of the band should still find a lot to like here.